Israeli soldiers abducted, earlier Wednesday, fifteen Palestinians in the West Bank, including ten children from occupied Jerusalem. Illegal colonists write racist graffiti near Ramallah. 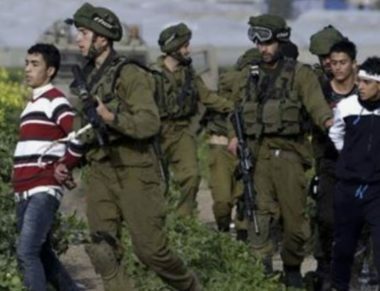 The Palestinian Prisoners’ Society (PPS) said the soldiers abducted ten children in Silwan town, including two who were taken prisoner while heading to their school when the soldiers assaulted and abducted them. The soldiers assaulted and injured the two children, before taking them to an interrogation center in the occupied city. The two children were unidentified at the time of this report, but the PPS identified eight of the abducted children as; Khader Mohammad Odah, 13, Jihad Jawad Abu Ramouz, 15, his brother Mohammad, 14, Sultan Sarhan, 14, Mohannad Zeid Mashahra, 17, Odai Adnan Gheith, 17, Omari Suleiman Mashahra, 17, and Samer Sarhan, 14. In Bethlehem, the soldiers also searched homes and abducted Ali Abu Hussein and Ali Naji Ayesh. Also in Jerusalem, the soldiers abducted Yousef al-Hawash from his home in the Old City. In Jenin, in northern West Bank, the soldiers abducted Adnan Khalil Malalha, a member of the Local Council of Sielat ath-Thaher town. In related news, a group of illegal colonialist settlers infiltrated into Ein Yabrud village, east of the central West Bank city of Ramallah, and wrote racist graffiti on a number of cars and homes.